Although a majority of events in the 1996 Olympic Games were hosted in or around Atlanta, Georgia, there were several other venues throughout the state. For example, Savannah, Georgia hosted the yachting events. 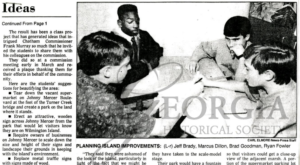 This newspaper article from April 29, 1993 relates how local 8th-graders are worried about how visitors will view their home. How do these goals compliment the rest of the Atlanta changes and preparations? “Concerned Students: Eight-grader Want Island to Look Good for Olympic Visitors.” Islands Closeup. Thursday, April 29, 1993. From the Georgia Historical Society Savannah Olympic Support Council Records. MS 1856-02-001. Click here to read item details in the Georgia Historical Society Catalog. 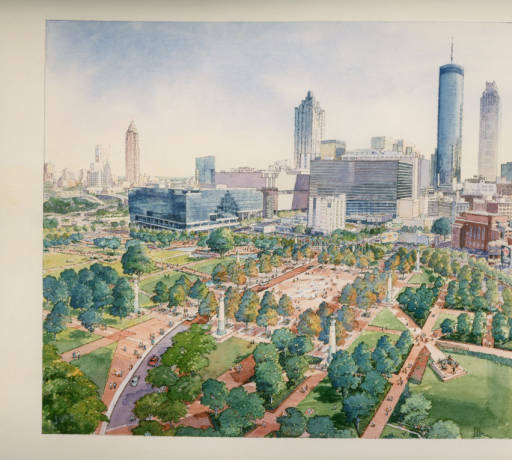 The rendering of Centennial Olympic Park in this set was also featured in the Atlanta Journal Constitution. The sketch shows the type of improvements the Olympic committee planners envisioned and executed in the lead up to the Olympics. Centennial Olympic Park remains an important green space for citizens and visitors of Atlanta. The sports venues built for the Olympic Games are now used by Atlanta’s professional sports teams and Atlanta’s business and tourism industry experienced a boom in the years following the 1996 Olympics. How do you think the town reacted? What would have caused negative reactions in Atlanta and what about the Games would have caused positive reactions? How did this kind of preparation for the 1996 Games change the city of Atlanta? 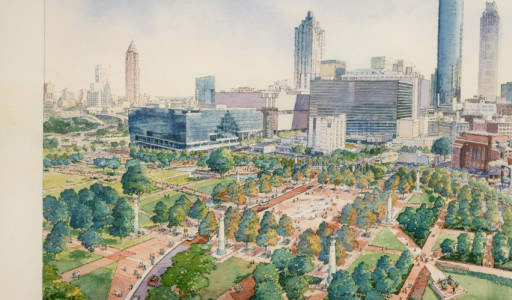 Would this have been surprising to Atlanta residents? 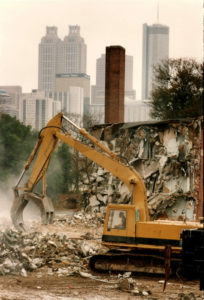 Excavator demolishing Techwood Homes, Atlanta, Georgia, November 17, 1993. 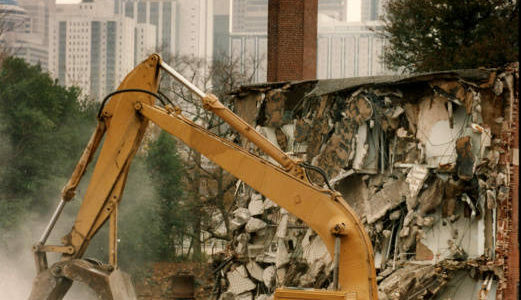 Atlanta Journal-Constitution Photographic Archive. From the Georgia State University Library Special Collections and Archives. AJCP312-005e. In 1982, former president Jimmy Carter founded the Carter Center, a non-profit organization dedicated to advancing peace and health worldwide. The center monitors elections, engages in efforts to advance human rights and democracy, and works to eradicate diseases in poorer countries. 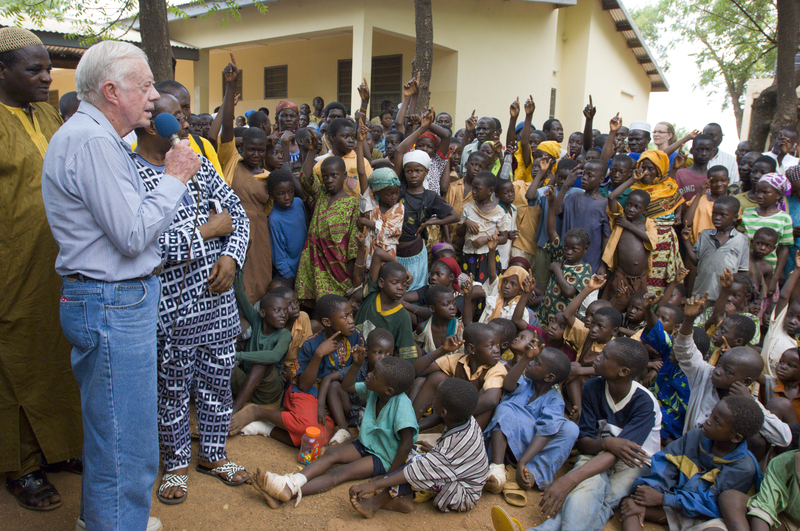 In this particular image, Jimmy Carter is addressing children in Savelugu Ghana, an area plagued by the Guinea Worm Disease. He has just asked, “Who here has had Guinea worm disease?” Through the efforts of the Carter Center, the Guinea Worm Disease is almost eradicated. Only 1,100 cases were reported worldwide in 2011. The disease is caused by drinking contaminated water. What standard did Carter set in building the Carter Center immediately after his 1982 defeat? How is did Carter’s photographs with these Ghanaian children help the efforts of Guinea worm disease? Carter Speaks to Ghanaian children February 8, 2007. Savelugu, Ghana. From the Carter Center Health Photos Collection. President Jimmy Carter is one of the most famous and influential Georgians in modern history. His presidency was plagued by domestic and international crises, one of the most dramatic of which was the Iran Hostage Crisis. On November 4, 1979, more than 60 Americans were taken from the American embassy in Tehran and were held hostage for 444 days. The entire nation watched the crisis unfold on television. The hostage situation stemmed from resentment over CIA involvement in consolidating power under Reza Shah Pahlavi in 1953. Ten years later, the Shah quelled an uprising, sending cleric Khomeini into exile. Although this action ended the immediate threat of revolution, it eventually sparked the Iranian Islamic Revolution. In January of 1979 the Shah was the one in exile and Khomeini was leader of Iran. The young revolutionaries who stormed the American embassy in November were upset that the United States had allowed the exiled Shah into the United States for cancer treatment. They refused to release the hostages until the Shah was returned to Iran for trial and the United States gave billions of dollars that the revolutionaries claimed they stole from the Iranian people. President Carter vowed to bring the hostages back safely. His administration tried economic sanctions and negotiations to resolve the crisis, but as the months passed with no sign of breaking, Carter approved a high-risk rescue mission. The mission had to be aborted due to malfunctioning helicopters, one of which crashed into a transport plane killing the pilot and injuring three others. The Iranians broadcast footage of the crash and mocked the United States in their failed attempt to protect their own citizens. 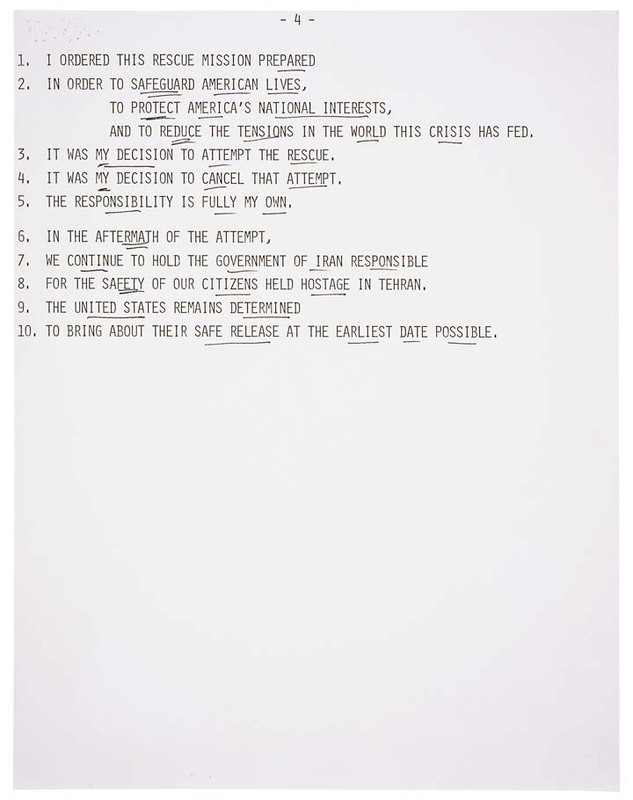 This primary source set includes a draft copy of Jimmy Carter’s speech given in response to this humiliating event. The document is housed at the Jimmy Carter Presidential Library and Museum and available online through the National Archives. How does this source demonstrate the mood of the nation during this event? How does this event and his speech set the mood for the rest of Carter’s presidency? 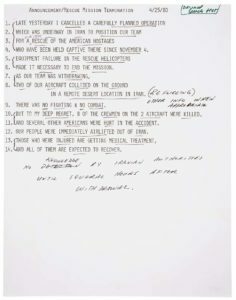 President Carter’s statement on failed rescue mission Message with annotations April 25, 1980. 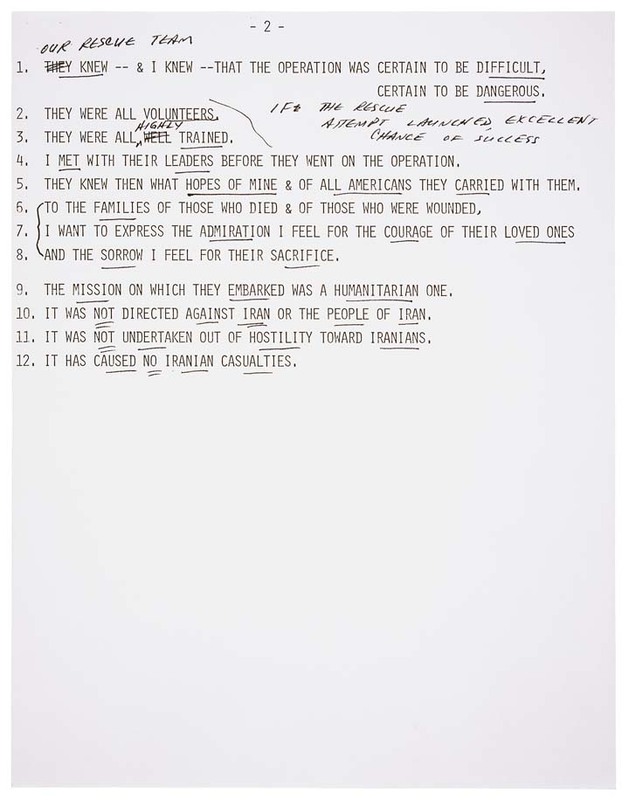 From the National Archives Catalog Records of the Speechwriter’s Office, 1977 – 1981 Collection. 08941_2005_002. Page 2. 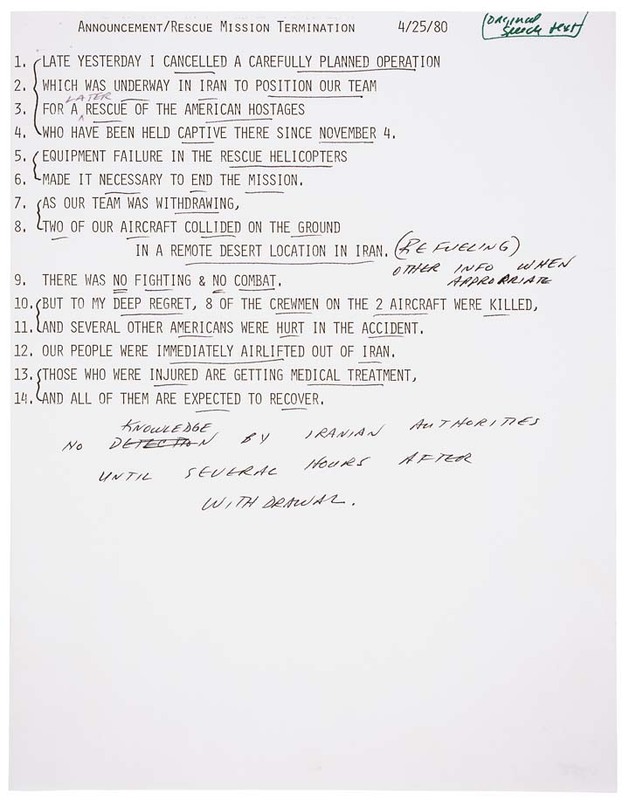 President Carter’s statement on failed rescue mission Message with annotations April 25, 1980. From the National Archives Catalog Records of the Speechwriter’s Office, 1977 – 1981 Collection. 08941_2005_003. Page 3. 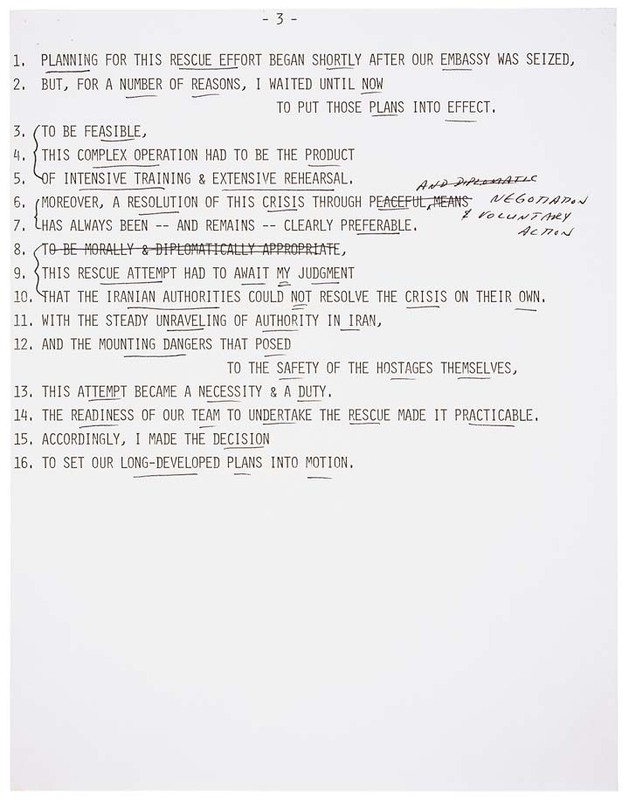 President Carter’s statement on failed rescue mission Message with annotations April 25, 1980. 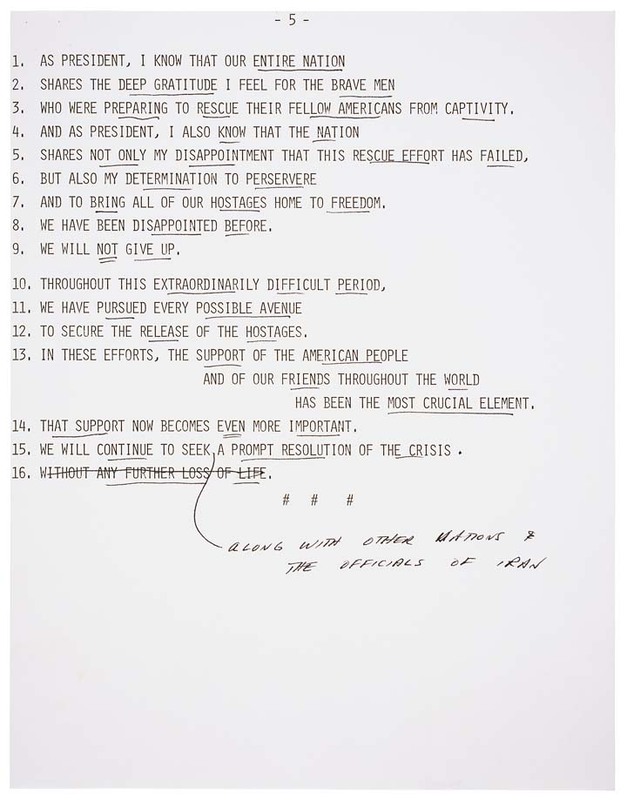 From the National Archives Catalog Records of the Speechwriter’s Office, 1977 – 1981 Collection. 08941_2005_004. Page 4.